Justin Gundlach and Channing Jones’s article, HUD Doesn’t Need New Legislative Authority to Better Integrate Climate Change Resilience into Its Disaster Recovery Program, forthcoming in the April issue of Environmental Law Reporter, states its basic argument in its title. The article identifies and analyzes the statutes that have guided the Department of Housing and Urban Development (HUD)’s approach to disaster recovery to date, as well as forms of “soft guidance” issued by HUD for use by various stakeholders, including both HUD community development block grant disaster recovery program (CDBG-DR) program officers and the state and local officials that interact with them. Comparing these materials reveals a tension between the requirement that all projects funded by CDBG-DR “tie back” to the most recent disaster, and the logic of resilience, which holds that one should always build or rebuild with an eye to the next disaster. The article notes some signs that HUD is working to reconcile this tension—in particular, the Rebuild By Design and the National Disaster Resilience Competition both promote resilience to future disasters, and HUD’s newly formed Climate Council is well positioned to make climate resilience a routine priority for HUD. 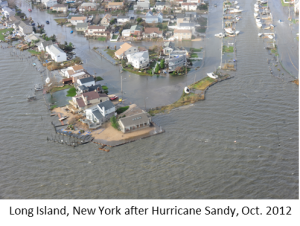 The article also suggests ways for HUD to carry this potential reconciliation forward into future disaster recovery contexts and also into other HUD programs that relate in less obvious ways to disaster recovery and resilience to climate change.